The Hardwick01873 854220work RestaurantThe Hardwick is a country pub and restaurant owned and run by chef Stephen Terry, who along with his wife Joanna, make it a priority to bring fantastic seasonal menus mostly prepared with local produce, to their customers. 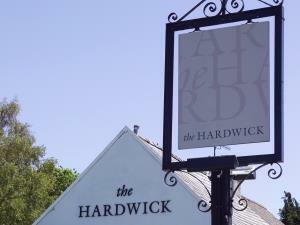 The Hardwick is a country pub which very much leans towards being a restaurant. This is largely due to the owner, that’s me, Stephen Terry, being a cook by nature and not a publican. The Hardwick is a place where everybody is made to feel welcome whether it be for a quick pint or meeting friends and family for lunch or dinner. Our aim at the Hardwick is for our customers to leave feeling satisfied and that their expectations have not only been met but exceeded. Our philosophy is simple and honest. We source, cook and serve to the best of our abilities at all times. Our produce is treated with the respect it deserves and served with the minimum of fuss and maximum of flavour. We use seasonal produce which allows our customers and staff alike to look forward to certain ingredients throughout the year.